I finished up the next Fall Stitchette this weekend. I was inspired by all the kids waiting on the corners for their buses with their GIANT backpacks. In other back to school news, all is well on the preschool front and I’m very relieved. He jumps in as soon as we get there and I have to chase him down for a goodbye kiss. That makes it easy to leave. He’s definitely ready to go by the time I come pick him up, weeping into kanga ready, but we’re working on that. We have a plan involving new covers that I think is going to do the trick! I am so excied for the new stichettes! I just love your patterns!!! Keep up the great job!! They’re so cute!!! I love the Make along and can’t wait to start cutting fabric and sewing!!! Thanks for such lovely inspiration and patterns. I love this new stitchette! I am also glad I was a 70s kid, although I remember having a little cart with wheels at one point in grammar school, but I walked quite a long way home from shcool. So good to hear that the pre-school is working out with Oscar and he is happy to be there. i want a sweater like that. The PDF thing works well,but I am not sure I have done the “click return “think and anyway I pefer you to have my personal adress(not the one I use with playpal) thank you! Almost done with Olive… so far so good! she is coming out rather nicely. Oooh! Can’t wait for the new stitchettes – I adore them! 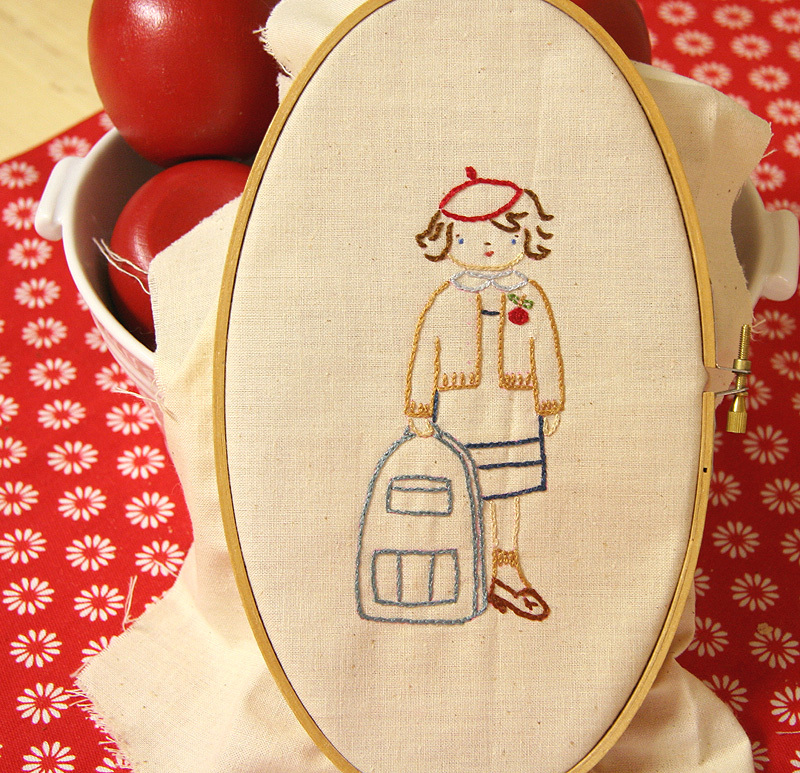 What a cute stitchette project! Ah, poor Oscar! I don’t understand how changing the covers will help, but no matter. Your latest stitchette is even more adorable than all those that precede it, I think. The new stitchettes are wonderful. Love the details on this one–the cropped cardigan, and those shoes!! You are always the queen of the shoes. these new stitchettes are so cute! I can’t wait! “weeping into kanga ready”–oh, so sweet. love that. I love the new stitchettes and can’t wait! I hope you’ll have the previous ones back for sale soon too! I want, I want, I want! I love your stitchettes! I hope one of the fall ones is going to have some pumpkins in it, and maybe a tree with fall leaves! I am so excited to see these. I cannot wait. This would be so cute to put on something of Em’s. Like a jumper…hmmmmmm…now when are these going to come out? Oh, she’s too cute. She’s my favorite yet!